of independence of Papua New Guinea. The project could not take off last year due to various reasons, hence it was carried out this year. 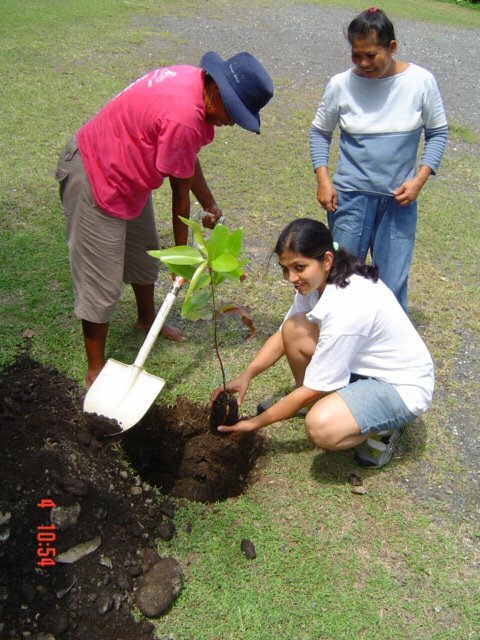 Every first saturday in the month of march, Soroptimists all over the world celebrate 'Saturday of Service (SOS) and dedicate the day in performing some community work. We chose to carry out our pending project on March 6th 2006. The two trees that were planted are: Pometia pinata (commonly called 'glabra'; in pidgin called 'taun') and Calophyllum inophyllum (in pidgin called 'kalapulim'). In the photo on right, I am planting the tree while current President Naomi is throwing soil and Secretary Cenona standing by the side, the photograph was taken by another Soroptimist Merilyn. This photo is taken by Merilyn Paul. 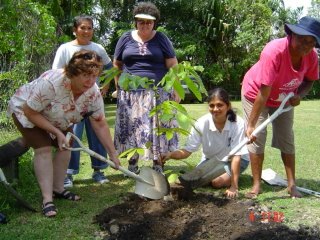 In the photo on the left, Merilyn and Naomi can be seen throwing soil while I am planting the tree, Cenona and Dawn admiring the young trees. What was good was that we all dug up the tough ground and planted the trees ourselves with very little help from two men who were around.